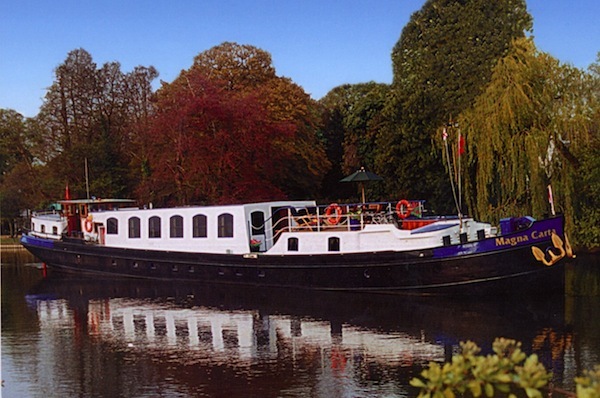 European Waterways, Europe’s largest luxury hotel barge cruise company, is offering for the 2013 season an exciting array of culturally-rich excursions on its luxury hotel barge cruises in England and Scotland, including newly-added tours. And an added attraction – there is no need for holiday-makers to fly – the canals and waterways can be reached by road, or rail. Cruise excursions highlight some of the fascinating local culture, history, and beauty of each region, as well as help guests experience some of the real-life settings made famous by their favourite movies and television dramas. These unique excursions, including entry fees to castles, vineyards, markets and other local places of interest, are part of the all-inclusive price of European Waterways’ barge cruises. For select departures on Magna Carta’s classic cruises, the company has added a NEW excursion to Highclere Castle, setting for the renowned period drama series, “Downton Abbey”. The impressive Victorian castle sits on a 1,000 acre estate and is the iconic home of the fictional Crawley family on the show. The “real” Downton Abbey has been owned by the Carnarvon family since 1679, where Lord and Lady Carnarvon still live today. There is a real similarity between life at Downton Abbey and a sedate voyage aboard the 75-year-old hotel barge Magna Carta along the Royal River Thames – the grace and elegance of a bygone age, combined with impeccable service, fine wines and gourmet cuisine. The cruise itinerary also features a private tour of Dorney Court, a beautiful Tudor home on the banks of the Thames, where “Elizabeth”, “The Other Boleyn Girl”, and Agatha Christie’s series “Poirot” were all filmed. The cruise concludes with a tour of Christ Church, one of the most prestigious colleges at the University of Oxford and one of the settings for Lewis Carroll’s “Alice’s Adventures in Wonderland”. An excellent video of European Waterway’s Magna Carta cruise in England is available on Youtube. European Waterways’ luxury hotel barge, The Scottish Highlander, cruises along the Caledonian Canal through varied lochs, along the Great Glen. Featured innine videos on European Waterways’ YouTube page, the tours on these cruises traverse Scotland’s medieval wonders, beautiful scenery and wildlife, and rich battle history. The cruises include a tour of the charming village of Fort Augustus, gateway to the famous Loch Ness and a visit to the magnificent Eilean Donan Castle, setting for the film “Highlander”, which sits ideally positioned on an island where three lochs meet. Once destroyed in the Jacobite Risings, the picturesque medieval castle is set against mountainous scenery, often affording sightings of dolphins and otters. Excursions will explore further the battle history of the Jacobite Risings, a series of rebellions across the British Isles in the 17th and 18th centuries, with visits toCulloden Moor, site of the last battle on British soil where the Jacobites were defeated in 1746, and to the battlefields of the massacre of Glencoe. Whether touring a royal palace in England, or a historic battlefield in Scotland, these daily excursions are part of the overall cultural experience. The company are continuously adding to and updating itineraries with new tours, ensuring the most authentic and interesting adventures in every cruise. The hotel barging experience is different from large vessel river cruising. It offers a slower paced, “gentle voyage of discovery” along the more intimate canals and waterways of Europe, allowing a small number of guests to become more fully immersed in the culture, history and gastronomy of the region. European Waterways is Europe’s largest all-inclusive luxury hotel barging company, offering vacations in nine countries and carrying over 2,000 passengers a year. Founded nearly 40 years ago, they own, operate and market a private fleet of luxury hotel barges with cruises in France, Italy, Scotland, Ireland, England, Germany, Belgium, Holland and Luxembourg. Pioneers in hotel barging, they were the first company to operate a hotel barge on the Upper Nivernais in Burgundy, and the “real” Loire Valley. It is also the only cruise company offering barge cruises in Scotland and in the Venetian lagoon and River Po valley.